Aqaba, Jordan, Monday 8th April: The Jordan Mixed Open Presented by Ayla, a pioneering new tournament engineered by the team at Ayla Golf Club, has proved an undisputed success, with competitors from all three co-sanctioning tours concurring that the innovative mixed format could set a blueprint for the future of the game. 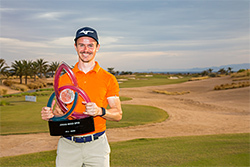 In a nail-biting finish to the inaugural event, which witnessed competitors from the Challenge Tour, Staysure Tour and Ladies European Tour (LET) compete alongside one another for the first time, Dutchman Daan Huizing (Challenge Tour) saw off Meghan MacLaren (LET) to claim a two-shot victory and carve his name on the Triquetra Trophy with an impressive 16-under-par total. Runner-up, MacLaren, who had previously spoken out about the disparity between pay and coverage of the men’s and women’s tours, demonstrated exceptional strength of character as she backed up her words with actions and highlighted the vast talent that presides on the Ladies European Tour with two consecutive rounds of 7-under-par 65, before final round of level par 72. In fact, with an almost equal number of players from each co-sanctioning tour making it through to the final day’s play and the leading three players composed of one competitor from each circuit, the script couldn’t have been written better for the team at Ayla Golf Club, who have been instrumental in the success of the innovative tournament. The success of the tournament has been attributed to the cutting-edge infrastructure Ayla has made available at its premises, effectively bolstering Aqaba’s readiness to host large-scale golf events at such a global scale. More importantly, it also demonstrates the skill and dedication of Ayla’s team, whose commitment has allowed the project to propel the development of Jordan’s golf landscape. The week, which showcased the potential and beauty of a country where golf remains in its infancy, was peppered with historic moments, including the first husband-and-wife to compete alongside one another in a professional golf tournament, and the first full-field golf tournament to see men and women go head-to-head over the same course for a single prize purse. Offering a myriad of retail, dining, and entertainment venues, Ayla’s colourful and dynamic community intends to be home to key seasonal events covering art, music, sports, recreation and entertainment activities throughout the year for residents and visitors to enjoy and experience.